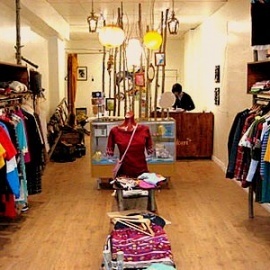 Artists & Fleas is a weekly weekend market in the heart of Williamsburg Brooklyn where over 100 independent merchants set up, showcase and sell art, design, fashion, food and vintage clothing and houesewares. First established in 2003, Artists & Fleas has cultivated an international reputation amongst buyers, trend-spotters and creative entrepreneurs as a place to showcase and discover what's new and exciting in fashion, vintage, art, design, handmade local goods and more. Artists & Fleas moved to North 7th Street in the Fall of 2010, expanding and evolving in sync with a neighborhood that exploded over the past decade. The market is situated just a few blocks from the shops, bars and restaurants of bustling Bedford Avenue and the L train and steps from the Williamsburg waterfront, which hosts Smorgasburg and the Brooklyn Flea, every weekend through November.